It all seemed so promising in August. All the pencils were neatly sharpened and the notebooks were in pristine condition. The schedule looked completely doable in its color-coded perfection there in your calendar. There was a school plan, a meal plan, a housekeeping plan and an activities plan. It was going to be a great year. Now it’s October and it’s all falling apart already. You have no idea what went wrong but something did. No one seems to be sticking to the schedule; the fourth grader can’t find his math book for the eleventh time; the meal plan isn’t working because you have no time to shop; your husband has been working late for a week, and the house looks like you just hosted a rodeo. Life. That’s what happened. When planning, we always forget that life unfolds along a course of its own. Taking care of family is the primary job of a homeschool mom, and families are made up of a bunch of unpredictable, intractable, frequently maddening small people called children. No matter how many colored pens and how much washi tape you use on your schedule children just happen, and you know what? That’s the way it’s supposed to be. You are there to tame the chaos and provide the structure but God put the wiggle in the children and He doesn’t expect you to be living in some idealized world where nothing is sticky and everyone is always polite. Kids are kids and adults are imperfect; therefore mud, lost books and piles of dirty clothes are just part of our lives. The important thing is to acknowledge that fact, take a deep breath, and then deal with it before it gets out of hand. These types of situations can usually be solved with one word. It’s not my favorite word either, but it is so necessary for a homeschool mom, in particular, to be disciplined. When I feel like things are starting to come apart at the seams, my first response is to examine my prayer life. It is essential to my peace and to that of my family that I do not forgo my daily rosary and Mass at least once a week besides Sunday. If these things are in place then I am in a good place, so make sure that you’re getting the spiritual shot in the arm that you need too. Once you have taken care of that, here are some other ways to get back on track. Carve out two hours every weekend to work on school for the upcoming week. This should be part of your weekly routine. You need the time to read through the lesson plans for the upcoming week, pull out any books that may be needed, make whatever copies and so on. This all takes time and shouldn’t be done in a rush on school mornings. Your whole life will change when you already have what you need in place every morning, and when you know what is going to be accomplished before the day begins. If you do the hardest thing first, the rest of the day will seem like a cakewalk, so have the children tackle their most difficult subjects first thing in the morning. Once they have eaten the frog, the whole day gets brighter. Seton students typically have about seven to nine subjects, if you include music, art, handwriting, etc., but it might be a mistake to try to do all of them every day. See if you can tinker the schedule so that bigger blocks of time are given to a subject on fewer days. For example, we do history for an hour and a half three days a week and science for two hours two days a week. Math, English and Religion are done every day, but there is a lot of flexibility in the other subjects and playing around with the schedule might make the days run more smoothly for you and your family. 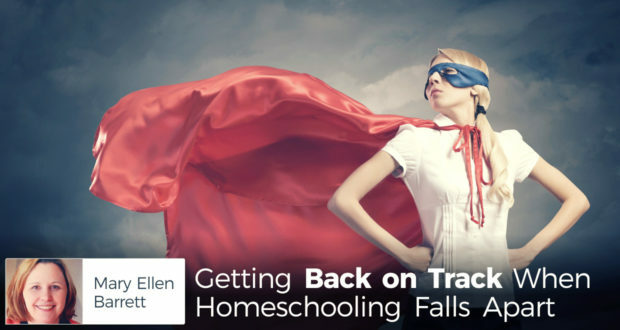 Having a bad day or even a bad month is no reason to get discouraged and question your ability to homeschool. Bad days happen, but they’re a blip on the radar of your homeschooling life, so don’t forget the big picture. Your child will not fail to be all that God created him to be just because you’ve had a rocky road here and there. Rather, these times will teach children that when you get off course in life, prayer, discipline, hard work and a good attitude are the best remedies. That might be the most important lesson of any your children will ever learn!